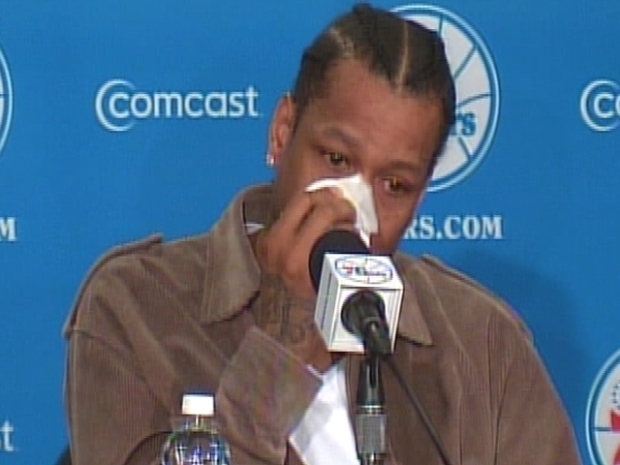 Allen Iverson returns to the Sixers. As the city buzzes over AIlen Iverson’s return, fans will get the chance to own a small piece of Sixer’s history. The cross pen that Allen Iverson used to sign his new contract on Thursday afternoon will be auctioned off on the Sixers Web site beginning on Friday, December 4 at 12 p.m. The proceeds will be used to benefit Sixers charities as well as the Comcast-Spectacor Foundation. Iverson was selected as the number one draft pick for the Sixers in 1996, beginning a brilliant NBA career in which he's earned four scoring titles, an MVP Award and a trip to the NBA Finals. Along with his accomplishments has come controversy, including disputes with coaches, off the court incidents and of course the infamous “practice” speech. Iverson left the Sixers in 2006 for the Denver Nuggets, the Detroit Pistons, and finally, the Memphis Grizzlies. His post-Sixers career has been largely marked by conflicts with team philosophy and an effort to find a place that could adjust to his unique playing style. Allen Iverson let his emotions show as he talked about Sixers fans, his past mistakes and what coming back to Philadelphia really means to him. Still, despite all the baggage he brings, Iverson also carries a superstar aura that will provide a much-needed boost of energy and excitement to the Sixers who have struggled to earn both wins and relevance in the grand scheme of Philly sports.